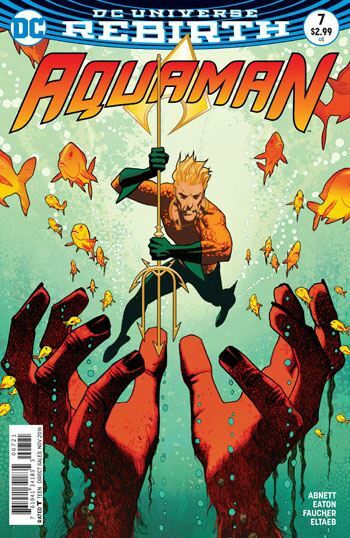 Aquaman 7 takes a bit of a breather after the recent run of battle issues, but that is not a bad thing. Abnett uses the time to explore Arthur’s role in Atlantis, and also develop the Black Manta subplot. His investigation into the supposedly Atlantean attack on a US ship reveals that the gear worn by the attackers, while appearing Atlantean, was modified to provide breathing apparatus. In other words, that it was humans pretending to be Atlanteans. Aquaman has questions, both for allies and old enemies, but learns little else during this tale. At least about the attackers. What he does learn is that his rule in Atlantis is an uncomfortable one, that he and Mera are still viewed as outsiders. This prompts Mera to accept a series of ritual challenges to prove her worthy of becoming their queen. That showing respect for Atlantean culture and tradition is an important factor in winning over the people. Of course, it’s a safe bet that these ritual challenges will prove a lot more difficult than Mera’s expects, but that will play out in a later issue. I quite enjoy the Black Manta scenes as well, with Blackjack at his side, as he wipes out any opposition he faces as he moves to take control of N.E.M.O. and make the secret criminal organization his own. Top marks got to Scot Eaton for the art on this story. I always love the detail of his work, and there is a panoramic view of Atlantis from the royal palace that is breathtaking in its beauty.